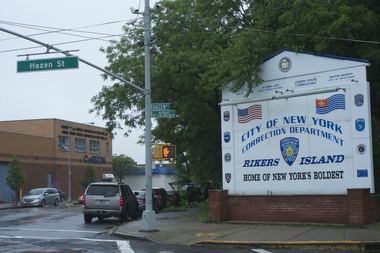 The entrance to Rikers Island and a neighboring Corizon building. NEW YORK CITY — The chief investigator for the city’s troubled Department of Correction has been partially relieved of duty after a damning report from the Department of Investigations accused him of spying on DOI staff, according to city officials. Gregory Kuczinski, Deputy Commissioner of Investigations at DOC, used agency staff and technology to listen in on conversations between DOI investigators and informants, and continued doing so despite explicit written orders from the investigations agency to stop, according to DOI Commissioner Mark Peters. News of the unauthorized surveillance, which was first reported Monday by The New York Times, came on the heels of another report from DOI on the misuse of agency vehicles by top DOC brass, and DOI saw “no alternative explanation” to suggest that surveillance of his investigators during a probe into DOC honchos was a coincidence, Peters said. Peters sent the letter detailing the surveillance of his investigators to Mayor de Blasio last week, but it wasn't until news of the spying allegations broke on Monday morning that DOC took the step to relieve Kuczinski of the bulk of his job title, including overseeing DOC investigations, while the city looks into the allegations, according to DOC representatives and the mayor’s office. DOC Commissioner Joseph Ponte said Monday at an unrelated council hearing that the surveillance of DOI communications with informants was the "inadvertent" result of the agency's use of data-mining surveillance technology. Ponte added that an investigator tasked with looking through that data brought to his attention the surveillance of DOI staff, and that he then alerted Kuczinski. But he did not address the allegation by Peters that Kuczinski continued the surveillance even after written orders from DOI to stop, nor did he address questions about the decision to relieve Kuczinski of his duties. Mayor de Blasio previously stood by his handpicked jails chief following a DOI investigation that found he had improperly used city-issued vehicles for personal use. De Blasio claimed that Ponte had received incorrect guidance and did not knowingly break city protocol on his numerous trips out of state with a department vehicle, prompting DOI to publicly release a statement calling the mayor out. Speaking publicly about the issue for the first time on Monday, Ponte said the source of that advice was Sara Taylor, a his former chief of staff and a holdover from the Bloomberg Administration, as well as members of his security detail who had also been on the job since before he started. In a statement about the unauthorized surveillance, Peter's called for Kuczinski to be fired.